A few years ago, Mexico created the Cross-Border Express, "The world's first truly binational airport terminal." 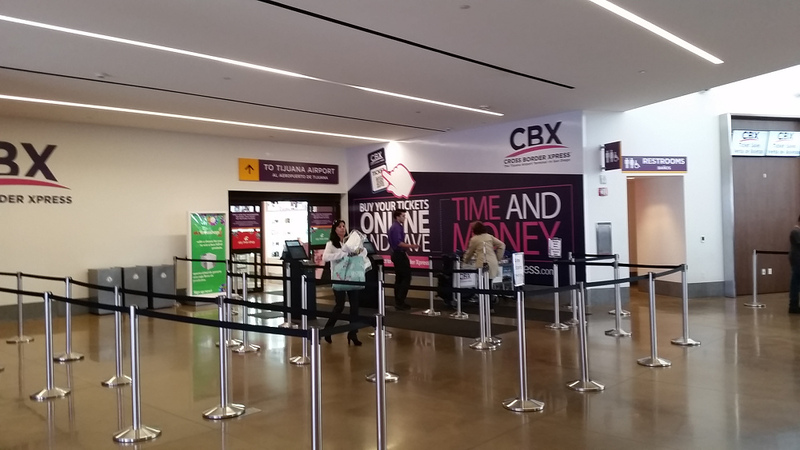 While located technically in the United States, about a 20-minute drive south of San Diego, CBX serves the Tijuana airport. Its purpose is to allow an easier way for people to access Mexican domestic flights out of Tijuana. So far, basically only Mexicans and Mexican Americans use the CBX. I'm going to change that with this guide. It's fantastic. Travel Advisor agrees. This is the entrance to the pedestrian walkway from the San Diego side of the Tijuana airport (It goes right through the duty-free store first). The design of CBX is sheer genius. If you are flying from the western United States or Canada, going through San Diego can save you hundreds of dollars in flight costs by making it easier to use Mexican carriers out of Tijuana by means of CBX for the Mexico leg of your journey. I've got to admit, the process initially confused and intimidated me, which is probably why this system is still so underutilized by American (Anglo) travelers. The thing to remember about CBX is that the entrance is in the United States, technically in Otay Mesa, about a $50 Uber ride south of San Diego. From that building, which itself looks like an airport, you take a pedestrian bridge over the border directly into to the check-in area of the Tijuana airport terminal. You grab your Mexican domestic flight from there. I've included a video of my Uber ride so you can see the route and U.S.-side entrance. This is a video of the drive to the Cross-Border Express in Uber from San Diego. The CBX is the world's first true binational airport passenger terminal. You enter the terminal on the U.S. side (Otay Mesa, south of San Diego) and take a pedestrian walkway directly into the Tijuana airport. If you can't book your flight far enough in advance to get a good fare on an American carrier, booking your flight through San Diego and then taking a Volaris flight out of Tijuana is an especially good option, as you can see in my screenshots comparing the fares of the same route and dates. To save money on air travel (and feel like a totally empowered expat to Mexico), here's how you do it. Instead of booking a direct flight to a Mexican city from the United States, you can reduce your overall flight costs by booking your flight to San Diego only (round trip) and then booking the second leg of your flight from Tijuana to wherever you are going in Mexico on a Mexican carrier (booking that as a round-trip as well), most likely onVolaris. To get to the Cross-Border Express (CBX) from the San Diego airport by car, you take the Brittanica exit off 905. You will see signs for CBX. Most people catch a shuttle or Uber (which costs about $35 if you give yourself time to use Line). CBX will come up on your Uber app without needing the address. Your Uber driver will be able to take you right to the CBX entrance (as you can see in the video). You enter the CBX building and get your boarding pass on the U.S. side. You do not check your baggage here, however, because you have not yet cleared customs. You also fill out your declaration form on this side. You will see a counter with pens set up for you to fill out the customs form before entering the pedestrian bridge (If you are applying for a Visa Temporal, it's critical you fill it out correctly, that you are coming in as a resident, not a tourist). To the left of the Volaris counter, you will see the CBX ticket counter. There you purchase either a one way ($15) or round-trip ($25) pass to use the bridge. You will likely be purchasing a round-trip ticket to save a little money. Take a picture of the bar code, as a picture can be scanned should you lose your return ticket. The door to the bridge is to the left of the CBX sales counter, CBX is clearly marked above the entrance. Free carts are available for your luggage if you need one. Once you enter the CBX line, you will have a bewildering (yet bemusing) moment of Mexican commerce as you are forced to walk through the duty-free store before reaching the sliding glass doors to enter the main part of the pedestrian bridge, the 10-minute walkway that leads you to eerily tranquil customs kiosks. A little further on you will reach the baggage screening area. Again, strangely tranquil after what you've grown used to in the United States. In fact, that's what makes this all so cool - the utterly peaceful atmosphere that surrounds the whole process. No one even seems to be in a hurry. After passing through the easiest, calmest customs and baggage screening areas you've ever experienced in your lifetime, you continue walking the bridge that takes you directly into the Tijuana airport terminal on the Mexico side. You will enter the terminal right where you need to check your bags. Volaris is at the furthest end of the terminal from where you enter from the pedestrian bridge. From there you will catch your much-cheaper Volaris flight to the city closest to your destination in Mexico. Once your Volaris flight arrives at your Mexican hub city, if your final destination is a smaller city, you can take a luxury bus for very little money to your final destination. For example, when I book directly from Denver to Mazatlán, unless booked months in advance, the round-trip fare tends to run at least $650. Instead, I book a round-trip ticket from Denver to San Diego for about $150. Then I book a Volaris flight from Tijuana to Culiacan (the capital city of the state of Sinaloa where Mazatlan is located ) for about $240 (or less if I ever knew my schedule further in advance). From Culiacan, I can take a luxury bus to Mazatlán, which takes about three hours. The bus trip costs about $10. This makes the total cost for the round-trip travel is $400 as opposed to over $650. You could follow the same basic plan if you were flying from Tijuana to Guadalajara, Mexico City, La Paz, León, Morelia, Mérida, Cancún, even Mazatlán. Take a Volaris flight from Tijuana to the city closest to your destination, then take a luxury bus the rest of the way. Like most people, you probably get nervous about being on time for international flights (but probably still not as nervous as my ex-boyfriends). If you are in the habit of giving yourself an ample time buffer to allow for missed exits, traffic jams and the like, rather than waiting it out with the general population when everything goes smoothly giving you time to kill, purchase access to the V.I.P. Lounge for $18 dollars when you purchase your Volaris ticket. Mexican airports don't offer as much seating as American ones do. V.I.P. lounges can be handy for charging electronics and resting up. English is not a first language in the Tijuana airport. To find the V.I.P. lounge, look for Carl's Jr. The entrance for the V.I.P. lounge is tucked in next to the Carl's Jr. entrance, then up a short escalator. Make sure to check your baggage before going to the V.I.P. lounge as they only allow carry-ons inside. You take an escalator up to the lounge, but can only take the stairs alongside it down (Welcome to Mexico) which would make a big suitcase a problem anyway. Volaris flies to all the larger cities in Mexico, including Mazatán. However, if you need to get to a smaller town, you will need to take a bus from the airport to that town. Don't worry, as these touring buses are much nicer than American buses. They are extremely comfortable, quiet and sometimes provide refreshments. Even expats with cars often take them, given the cost of gasoline in Mexico. It's likely you won't have to wait long for a bus that goes to your destination. In the case of my trip to Mazatlán, I took a flight from Tijuana to Culiacan, where buses leave the station every 1/2 hour for Mazatlán. I thoroughly enjoy winding down on one of these buses if the direct flight to Mazatlán is too expensive or doesn't work with the rest of the flight schedule. Even if you don't think the CBX process is worth it just to save a few hundred dollars, knowing about CBX in San Diego can come in very handy. There are three major reasons why you should do it (at least once). 1. If you don't have the lead time, months often, to get an economical rate on domestic American flights, you can get a reasonably priced Volaris flight with a day or two notice and clip a little of the otherwise high cost of your trip. 2. San Diego is a beautiful city and a wonderful place to spend a few days on your way to Mexico. You can break up the trip over a few days and take it at a more relaxed pace by making your first leg to San Diego and your second leg in Mexico a day or two later. 3. The adventure of it. You save money and have a more authentic Mexican experience. Likely you will be the only obvious Anglo on your Volaris flight (until this blog goes viral). 4. I'm a big believer in always having options. Familiarizing yourself with this process gives you additional choices in how to travel to and around Mexico more economically. If you are getting nothing but outrageous fares online, do a comparison with Volaris. For example, I can often only make my flight arrangements for Mexico a few weeks in advance, after I have secured a renter for my place in Denver. 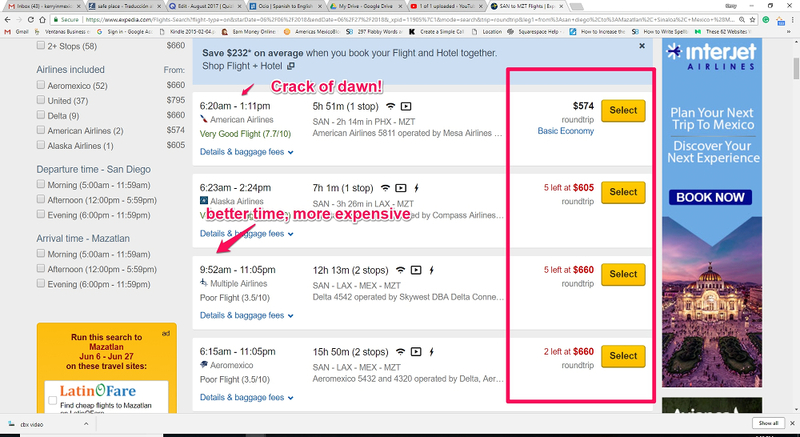 Here are screenshot comparisons of the prices for flights from San Diego to Mazatlán on American carriers vs. the cost of flying from Tijuana to Mazatlán on Volaris if I had only two weeks lead time to plan the flight. My choice on Volaris for the same dates (in pesos and dollars) using CBX to access the Tijuana airport. You can save additional money if you join Volaris frequent flyer program (Tarifa v.club as you see above) for about $50. You will need to have a Mexican phone number though. You will also need to book your flight online to get the cheapest fare. The way I look at CBX and taking Volaris is that even if I have to pay for changing a flight or a night in a Mexican hotel, I will save a little money and still have a lot more of a Mexican Experience than going from door to door on an American domestic carrier. Every Mexican Experience prepares you a little better for the next Mexican Experience. With all the coordination of flights, things can happen. Should you miss a flight or one gets canceled and you get marooned in a Mexican city, knowing a good hotel comes in very handy. During my last trip to Mazatlán, the apartment I had rented there still needed to be cleaned the day I'd planned to arrive. I decided to spend the night in a hotel in Culiacan and take the bus the next day. My business associate and former housemate, The Intrepid Elise, suggested City Express. These hotels, located near airports in 30 cities in Mexico are much like U.S. business hotels near airports. You can get a shuttle to their hotels at the airport from the same kiosk you use to pay for other cabs. You probably won't be in the mood for adventure. You'll want it fast, clean, easy, safe and cheap. These hotels meet those requirements. City Express hotels have excellent internet and cable, are immaculate, well-air-conditioned with a split in each room, and secure (You use your room key to access the elevator). They provide a nice breakfast in the morning until 10:30, have English-speaking staff and even offer room service. Check-out is at a languid 1:00 p.m. I highly recommend the hotel under these circumstances. The cost is about $50 or so a night, except in Mexico City ($92). All cozy between the sheets in my cold room with a remote in one hand and a cheeseburger in the other, I didn't want to leave the room the next day for the bus station, only a quarter mile away. A night in a neutral business hotel was the perfect tranquilizer after a day of passing through the cultural membrane, however porous it has become. 16 surprising things you'll want to consider taking to Mexico. Next up: Do you find yourself sighing some days? How would you describe them? Most recent: If you are learning your Spanish, keep it to yourself. Kerry Baker is the author of two books. "If Only I Had a Place," is your guide to renting well, long-term in Mexico. It's full of information about how to lay the infrastructure to get the most luxurious places for less, year after year. It includes a listing of rental concierges in most of the most popular expat destinations. It's crucial that you preview a place before signing the dotted line. Use the information in this guide to learn the critical differences between renting in Mexico and renting in the U.S.
You may have noticed that the Volaris website included in this article is in Spanish, proving yet again how speaking the language saves you money when you live in Mexico. Getting to conversational level takes a while. Get started before you leave with the tools in "The Interactive Guide to Learning Spanish Free Online." I use the guide almost every day to create unique lesson plans. I'm never bored, which is the key to sticking with it.